Investing can be daunting, whether you are experienced or a beginner. Even if you feel confident about your investing strategy, it can be easy to lose focus or make decisions based on emotion. Here are seven quotes from successful investors, economists, and other insightful thinkers that may help provide perspective and focus for your own investing strategy. "The individual investor should act consistently as an investor and not as a speculator.1"
— Benjamin Graham, investor, author, and teacher known as the “father of value investing.” A speculator takes large risks in the hopes of making large quick gains. An investor focuses on risk-appropriate strategies to pursue long-term goals. "Don’t try to buy at the bottom and sell at the top. It can’t be done except by liars.2"
— Bernard Baruch, investor and presidential adviser. Trying to time the market may be tempting, but it rarely works, because no one really knows when the market has reached its top or bottom. "If you aren’t thinking about owning a stock for 10 years, don’t even think about owning it for 10 minutes.3"
— Warren Buffett, investor, businessman, and philanthropist. Buffett, a former student of Benjamin Graham, is perhaps the most famous proponent of patient “buy and hold” investing. "Stay the course.... Changing your strategy at the wrong time can be the single most devastating mistake you can make as an investor.4"
— John Bogle, investor and mutual fund industry pioneer. A sound investment strategy should be designed to carry you through market ups and downs. "Know what you own, and know why you own it.5"
"Investing should be more like watching paint dry or watching grass grow. If you want excitement, take $800 and go to Las Vegas.6"
— Paul Samuelson, 1970 Nobel laureate in economic sciences. Investors often make poor decisions when they are driven by adrenalin; patience is more likely to produce positive results in the long run. 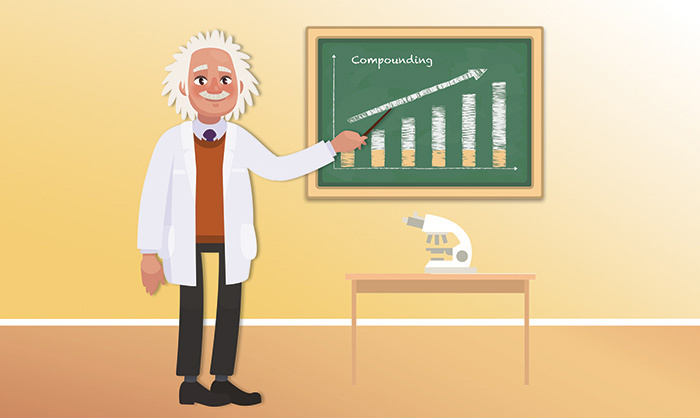 "Compound interest is the eighth wonder of the world. He who understands it, earns it … he who doesn’t … pays it.7"
— Albert Einstein, 1921 Nobel laureate in physics. Even though this and similar quotes are often attributed to Einstein, it’s uncertain whether he ever said them. Either way, it’s true that one of the most powerful tools for investors is reinvesting interest, dividends, and capital gains. There is no guarantee that any investing strategy will be successful. All investments are subject to market fluctuation, risk, and loss of principal. When sold, they may be worth more or less than their original cost. Investments seeking to achieve higher returns also involve a higher degree of risk. We are licensed to sell Insurance Products in CA,FL,GA,MA,MD,MO,NH,NY,PA. We are registered to sell Securities in CA,FL,NH,NY,PA. Securities and Investment Advisory Services offered through Voya Financial Advisors, Member SIPC. Quantitative Wealth Management is not a subsidiary of nor controlled by Voya Financial Advisors.